Crystal Mountain made headlines in 2007 when it decided to serve its largest-ever expansion with a brand new, $3 million fixed-grip double chair. For perspective, 1985 was the last time a new double as long as Northway was built. The Northway pod at Crystal is as big as most ski resorts. The Northway expansion added lift service to 1,000 acres of advanced tree skiing and bowls, an area bigger than most US ski areas. “Northback,” as it was known had been open for years but required an epic traverse or bus ride back to the base area. John Kircher of Boyne Resorts decided to build a lift but keep its capacity and speed low. Only a handful of trails were cut in the Northway pod with no grading or grooming. The result is awesome powder skiing with virtually no crowds. There isn’t even a maze at the bottom of the lift. The base terminal was built by helicopter and has no electricity. All 19 towers were delivered by a K-Max helicopter. The Doppelmayr CTEC double moves only 1,200 skiers per hour (Crystal’s workhorse six-packs move 3,600.) Because it services exclusively advanced terrain, Crystal can get away spinning Northway at a quick 550 feet a minute. That means 1,843 vertical feet in less than 10 minutes. The bottom of the chair is located in the middle of nowhere with no road access or electricity. With the exception of the top terminal, the entire lift was built with a spider excavator and helicopter. As you crest the first ridge after boarding Northway, you realize how long it is. At 5,422 feet, there are plenty of longer lifts out there but few that access such varied terrain. Only once you reach the top do you feel like you are back at a ski area. Bubble Chairs: Making a Comeback? 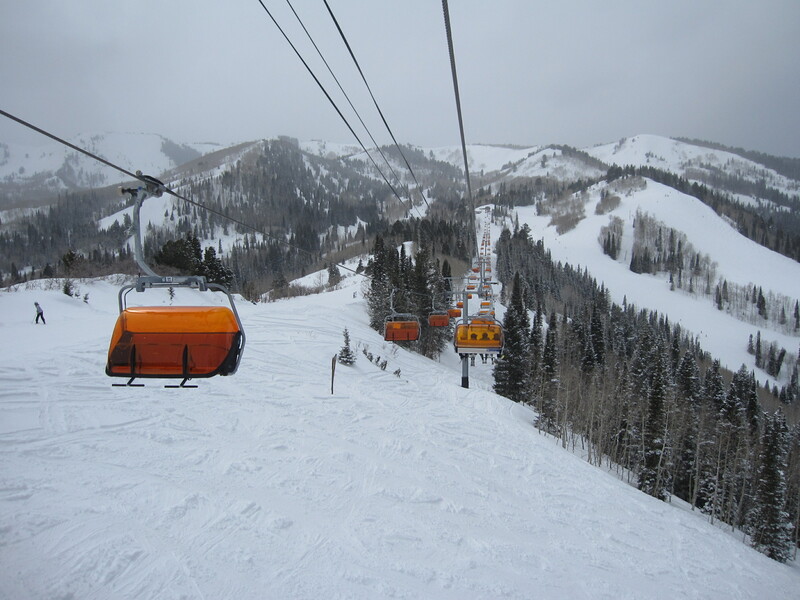 Orange Bubble Express at Canyons Resort. Growing up in the rainy Pacific Northwest, I happen to love chairs with bubbles. I can get the comfort of a gondola without taking my skis off or enjoy fresh air like on any other chairlift. Lifts with bubbles are technically very cool too. Electronic eyes in the lift terminals know when chairs are empty and the bubbles lower automatically. Chairs stay dry and lifties don’t have to sweep them or flip chairs at night. Bubbles everywhere at the Yellowstone Club. Despite their added comfort, bubbles haven’t really caught on in North America. Europe is a different story where 30+ lifts are built with them every year. In the US and Canada, Doppelmayr has built 16 lifts with bubbles since 1985. You can find them at Whistler-Blackcomb, Sun Peaks, Mont-Saint-Anne, Big Sky, Canyons and Stoneham. The Yellowstone Club also has bubbles on all six of their quad chairs. Power company blames ski resort, ski resort blames power company for gondola downtime. 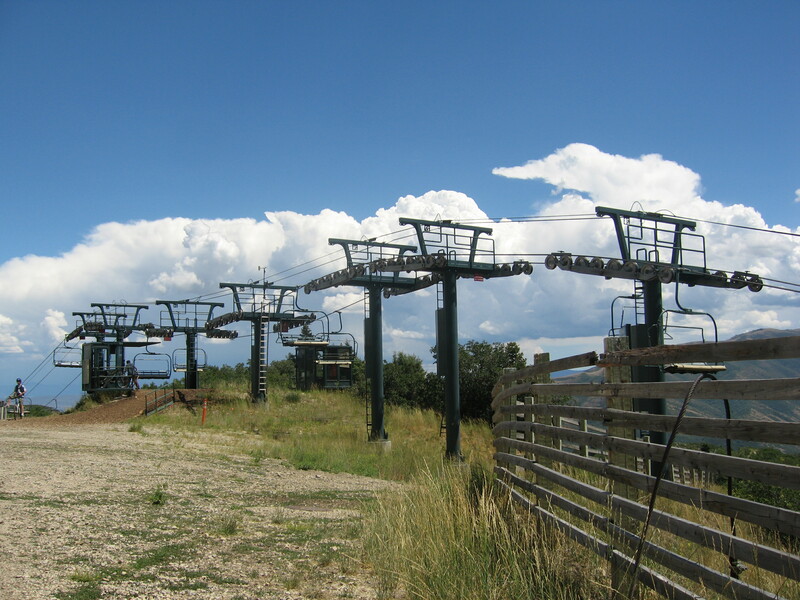 The last of 12 Riblets at Snowmass is being replaced with a Leitner-Poma high speed quad. Doppelmayr already flying towers on Snow King Mountain. Jury sides with Terry Peak in wrongful death tower pad lawsuit. Another setback for Jumbo Glacier Resort, the idea that just won’t go away. Does BC really need another Revelstoke or Kicking Horse? 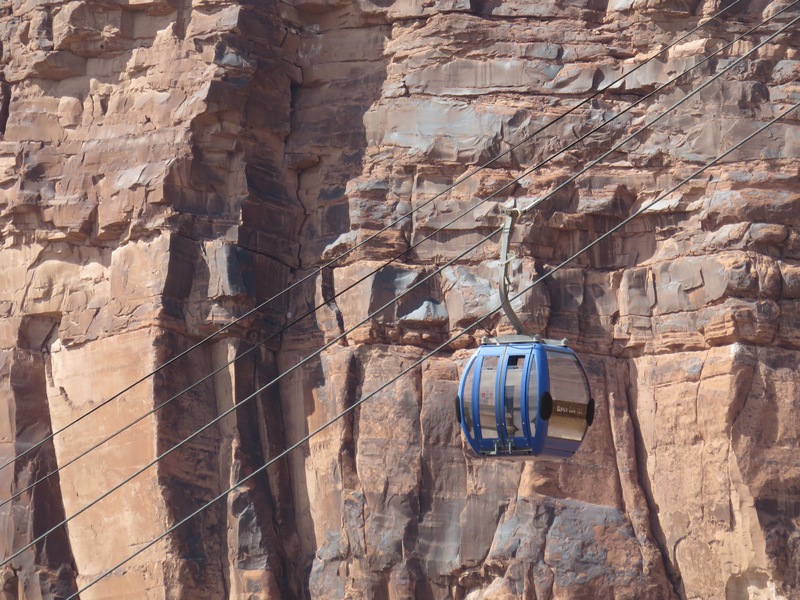 New Navajo nation president may not like the Grand Canyon gondola plan. Maine newspaper digs deeper into ski lift safety in the wake of Sugarloaf’s 2 major incidents. Be sure to check out the bottom of the page which has inspection records for every lift in Maine. A “3S” is a detachable gondola with two track ropes and one haul rope. It combines the speed and stability of a tram with the capacity of a gondola. Cabins generally hold about 30 passengers. 3S systems can move up to 4,500 passengers per hour at up to 8.5 meters per second. They can withstand high winds and traverse long spans between towers. These highly capable lifts are also expensive. Only 12 3S gondolas have been built. 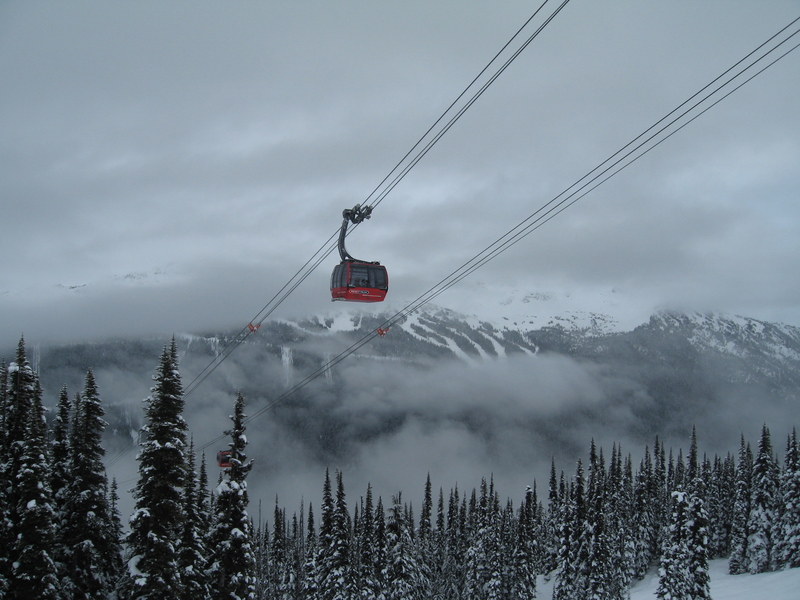 Perhaps the most famous of them, Whistler’s Peak 2 Peak, cost $51 million! 3S Gondolas are huge machines. The 3S was developed by VonRoll of Switzerland. The first one to open was the Alpin Express at Saas-Fee in 1991. A second section opened in 1994. When Doppelmayr merged with VonRoll in 1996, they inherited the 3S technology. Doppelmayr built its first 3S in 2002 at Val d’Isere, France. Called L’Olympique, it accesses the famous ski area of Escape Killy. Kitzbuhel, Austria opened the 3S Bahn in 2004. It connects two ski areas across a valley with an 8,200 foot-long unsupported span. 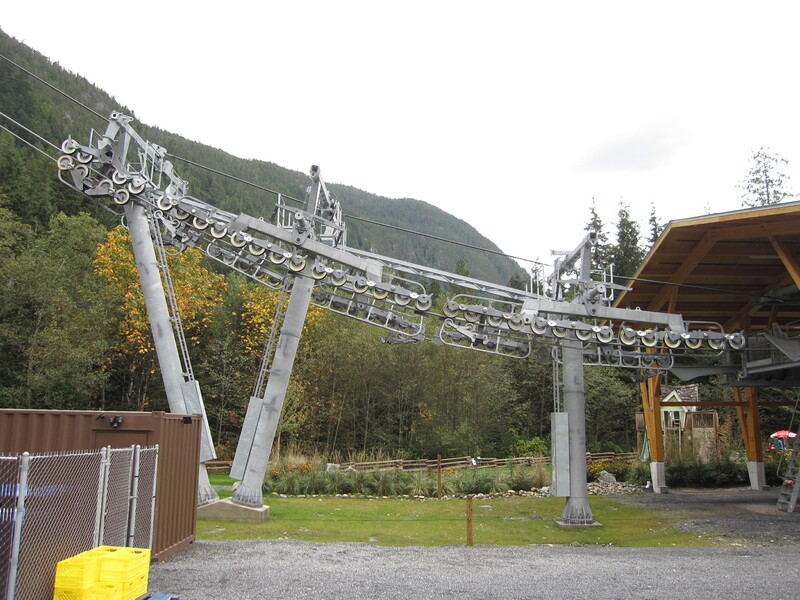 Four years later, Doppelmayr connected Whistler and Blackcomb with the Peak 2 Peak, featuring an even longer unsupported span of 1.88 miles. Peak 2 Peak’s highest point above ground is an incredible 1,427 feet. It remains the only 3S gondola outside of Europe. Whistler-Blackcomb’s Peak 2 Peak Gondola. Leitner got into the 3S business in 2009 with a system in northern Italy. The towns of Renon and Ritten were connected by a 2.8 mile-long 3S. This was the first 3S built outside of a ski resort. Another urban 3S was built across the Rhine River in Koblenz, Germany in 2010. 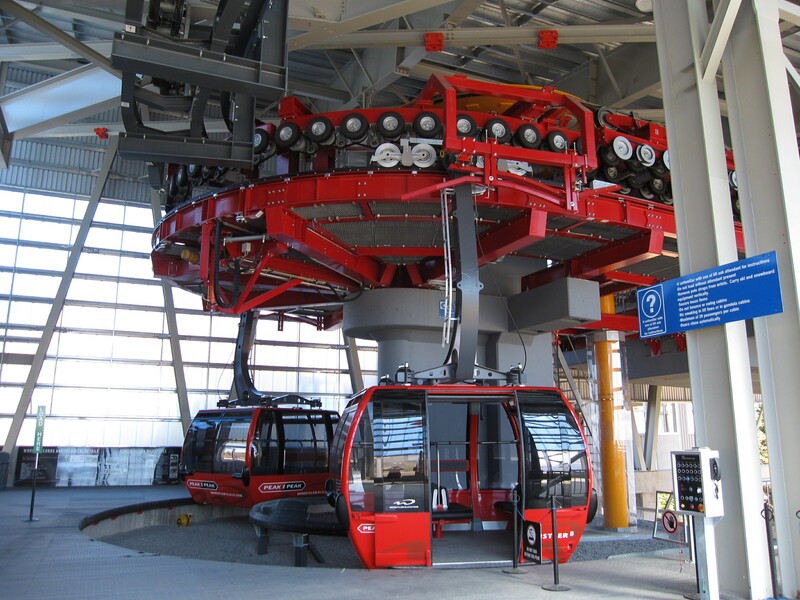 This Doppelmayr system moves 3,800 passengers per hour in each direction. Also in 2010, Doppelmayr built the Gaislachkogl 2 at Solden, Austria. 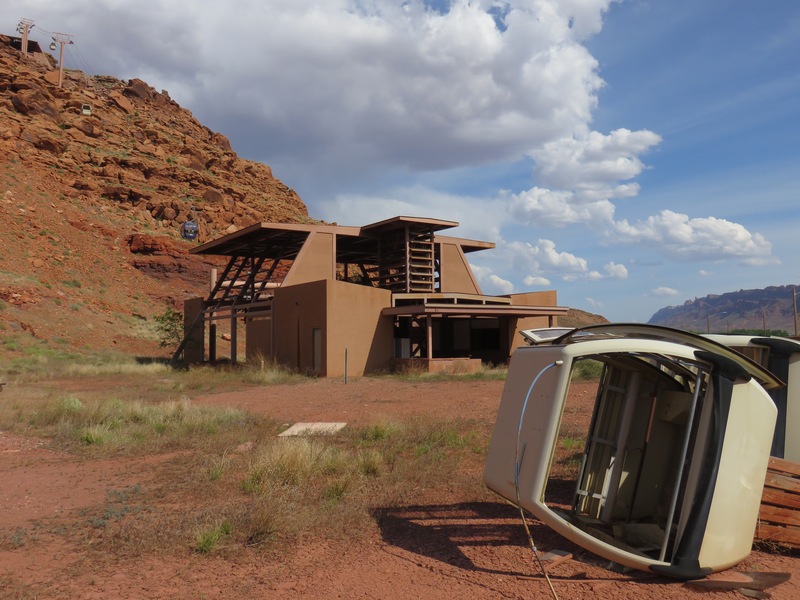 Moab, a town of 5,000 in the Utah desert is the surprising home of two failed lift projects – a gondola that never opened and a modern chairlift that lasted only a few years. 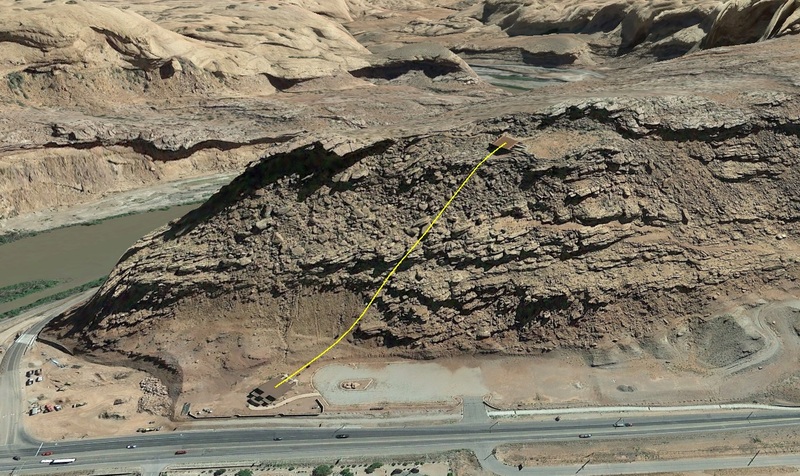 Moab Scenic Tram from Google Earth. Just south of Arches National Park stands the Moab Scenic Tram. It’s actually a pulse gondola built by Doppelmayr. A small group of investors spent $3.3 million to build the gondola along with a parking lot and two terminal buildings in 1999. From the outset it was criticized as the “tram to nowhere.” Scheduled to open in April 2001, the tram’s owners got in a fight with the county over a removal bond to be paid in case the business failed. Ironically the business never opened and the vandalized tram remains 16 years later. Its windows and control panels have been smashed and graffiti is everywhere. The lift is very short with only five towers and a handful of cabins, some of which never made it onto the haul rope. It is probably the world’s newest gondola to be tensioned with a counterweight and without level boarding. If you’d like to check it out in person, it’s hard to miss at the intersection of US 191 and Route 128. 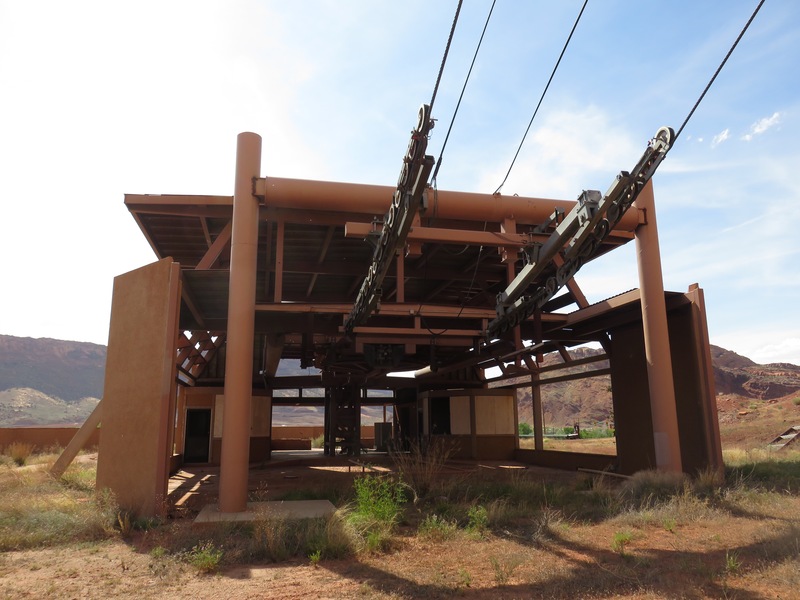 The lower terminal of the Moab Scenic Tram sits abandoned in 2015. The lift never carried a single customer. Some cabins remain on the line while others lie in ruin at the base station. The Moab Scenic Skyway scaled the Moab Rim. 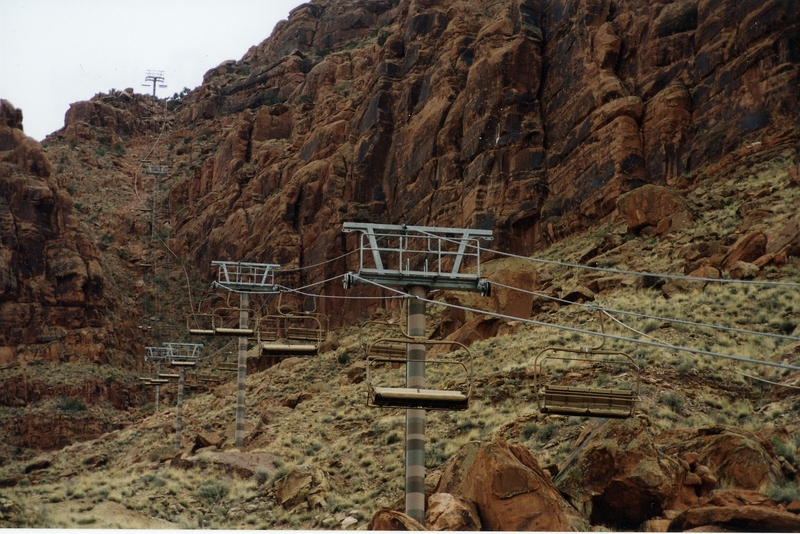 On the other side of town was the Moab Scenic Skyway, a Garaventa CTEC quad chairlift which took hikers and bikers 1,000 feet up to the Moab Rim. Longtime resident Emmett Mays had dreamed of building a lift on his property since the 1970’s. 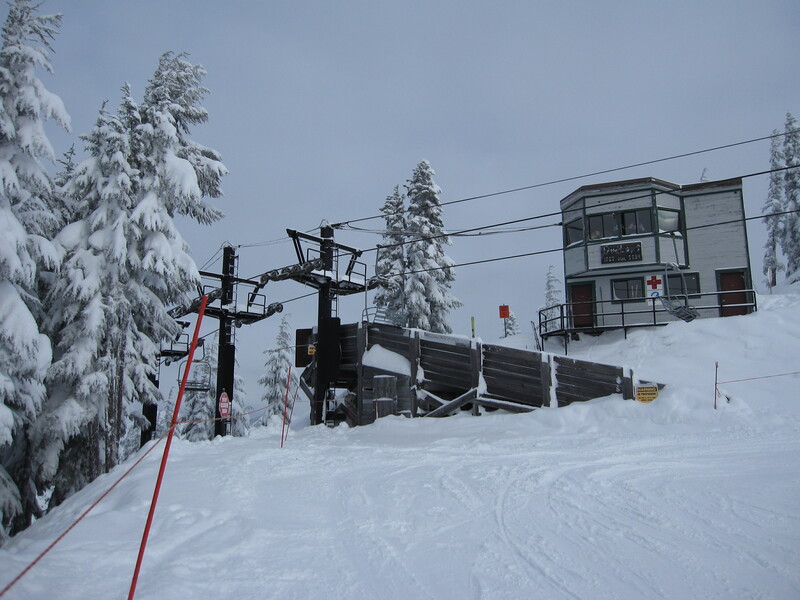 He spent $2.2 million to build the lift, trails and parking lot and it opened in May 1999. The entire lift was painted brown and orange camouflage colors to blend in with the rocks below. Designed purely for sightseeing, it ran 250 feet a minute and took 16 minutes to ride round-trip. The attraction lasted five years, closing in 2004. The Nature Conservancy bought the land and the lift was sold to Whitefish Mountain Resort in Montana. It operates today as the Easy Rider Quad. The galvanized chairs still have patches of brown paint on them! 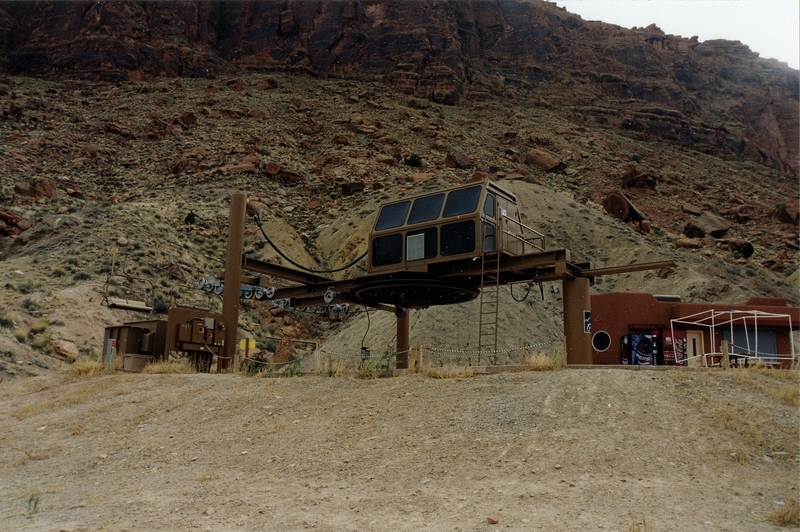 Moab Scenic Skyway circa 2002. 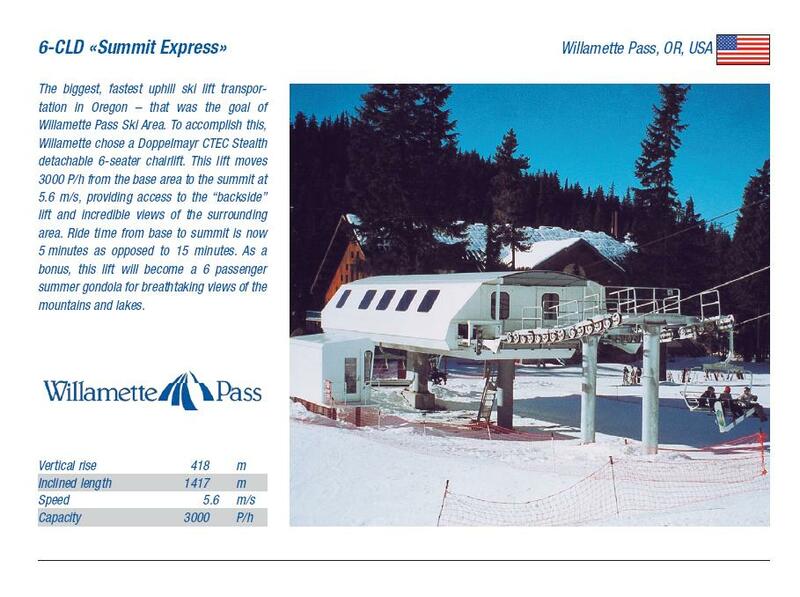 The “biggest, fastest uphill transportation in Oregon” may go away. The list of “lost” detachable lifts is short. Ascutney Mountain in Vermont spent $2 million to build the North Peak Express in 2002 but went into foreclosure in 2010 and never reopened. Creditors sold their flagship lift to Crotched Mountain, NH and SkyTrac moved it there in 2012. Crowdfunding campaign to put up a used Riblet double in BC not going very well. Skier-lift tower collision ends badly at Deer Valley. 2 Borvig quads at Sugarloaf won’t reopen this season. Spokesperson says they have not decided what to do for next year. Woman wants $75,000 after maze sign fell on her at Park City Mountain Resort last season. Deropement and rope evacuation at Winter Park. Three days in, conservation group vows to kill Squaw’s Base-to-base gondola plan. This week Squaw Valley and Alpine Meadows announced plans for a base-to-base interconnect gondola. Such a project has been likely ever since Squaw and Alpine merged in 2011. 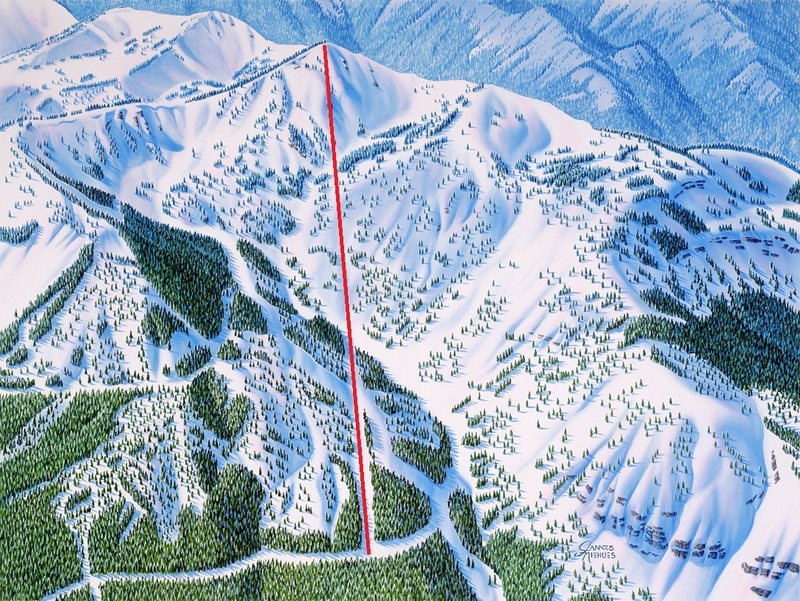 The gondola’s alignment will include two angle stations with skier unloading – one below the summit of KT-22 at Squaw and the other on the ridge above the Alpine Meadows base area. The two end sections will be within their respective ski areas and able to run independently of the middle stage. 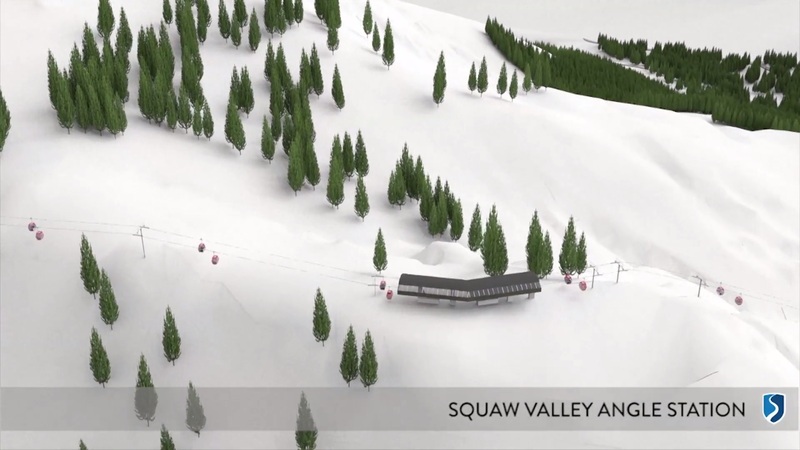 Rendering of the Squaw Valley angle station near KT-22. It took Squaw four years to come up with this plan in part because the gondola will cross land owned by three different entities. The Squaw section will be mostly on private land owned by Squaw Valley Ski Holdings. Just before the first angle station, the alignment will cross into land known as White Wolf owned by Troy Caldwell. You may remember Troy began building a private lift on his property a few years ago. So far only the towers have been completed. One thing that many people don’t realize is that the top terminals of the KT-22 and Olympic Lady lifts are already on his property. We will never know how much Squaw Valley Ski Holdings pays Troy Caldwell to lease this land but I am sure it is a lot. The second midstation and all of the Alpine Meadows section will be in the Tahoe National Forest. 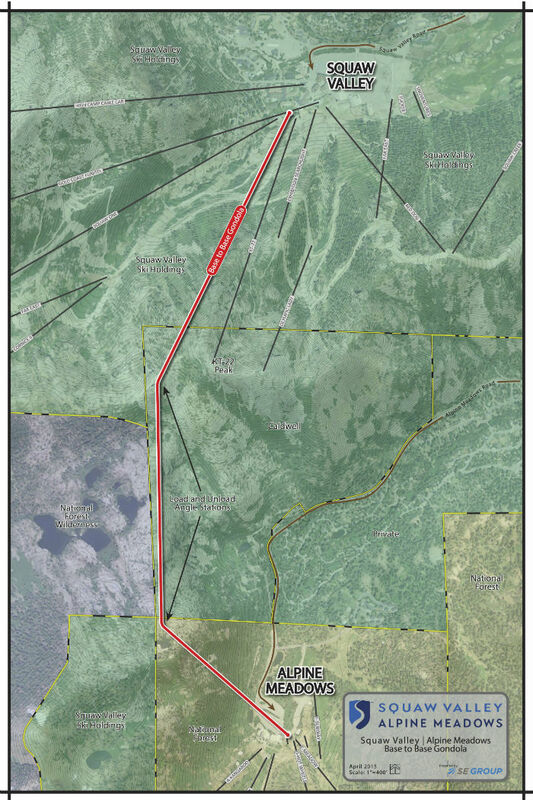 Map of the proposed gondola alignment. This would be the first gondola in North America with the ability to run three sections independently. 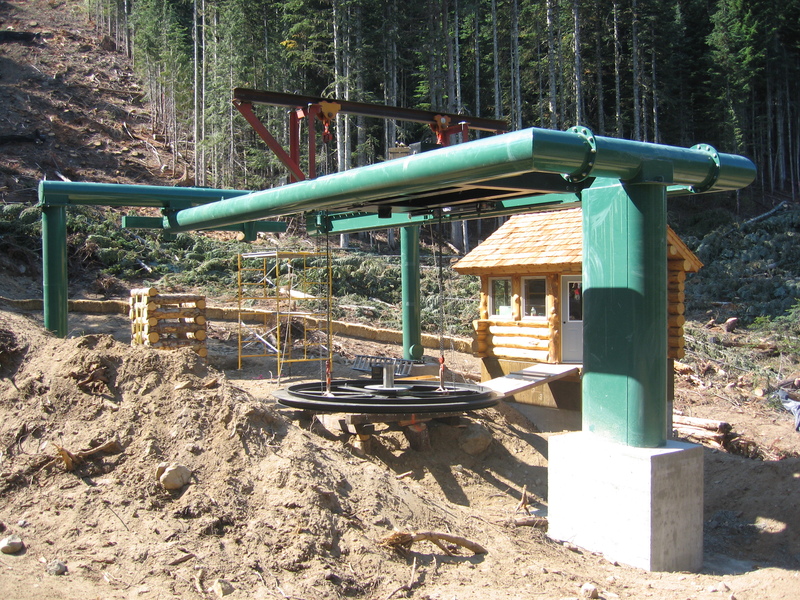 Breckenridge’s BreckConnect has two angle stations but only one drive and haul rope. 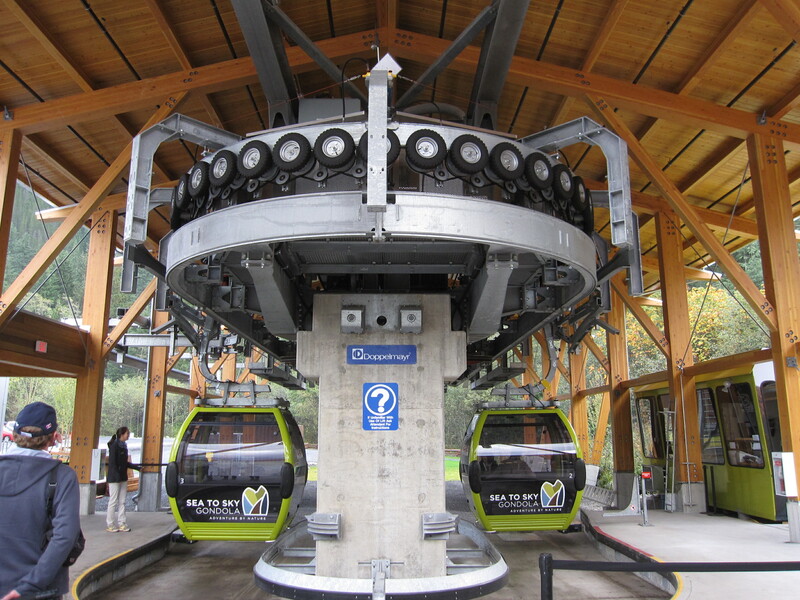 Examples of gondolas with two independent sections are the Whistler Village Gondola and Revelstoke’s Revelation Gondola although these resorts rarely run sections independently. Killington sometimes runs just the upper stage of its Skyeship Gondola. As proposed, the base-to-base gondola will be about two miles long and take 13.5 minutes to ride. 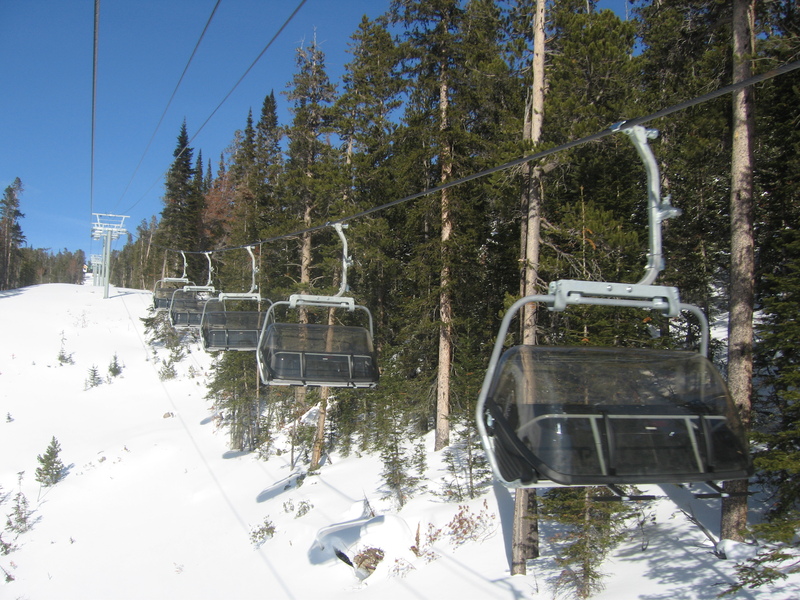 Capacity will be a relatively low 1,400 skiers per hour in each direction with 8-passenger cabins. 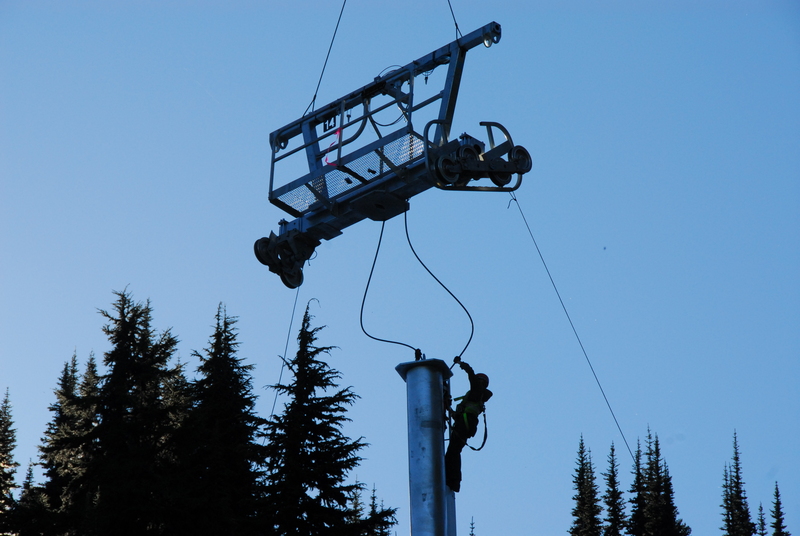 Squaw’s CEO, Andy Wirth, noted they are in talks with both Doppelmayr and Leitner-Poma. Squaw has never had much brand loyalty – They built a Doppelmayr six pack in 2007 and an L-P one in 2012. Before any contract is signed Squaw needs approval from the Forest Service and county which could take a few years. In the meantime they could really use a good snow year or two!